If you're hosting guests for Christmas or New Year's Eve, you may be feeling the time crunch to get your home in order before the company arrives. And if you also happen to be a cleaning procrastinator who hasn't started prepping yet, the pressure is really on. Take a deep breath, and repeat after me: You don't have to clean everything. When you're trying to speed clean, it's more effective to focus in on the areas your guests are sure to notice, and ignore the spots they'll likely (fingers crossed) never see. To make your pre-hosting cleaning routine as fast as possible, go ahead and skip the seven cleaning tasks below. When you have more time and the guests are gone, you can start dusting the crown moldings and polishing your silver—but for right now, focus on things they'll definitely notice: vacuum the living room, wipe down the kitchen counters, and replace the toilet paper. 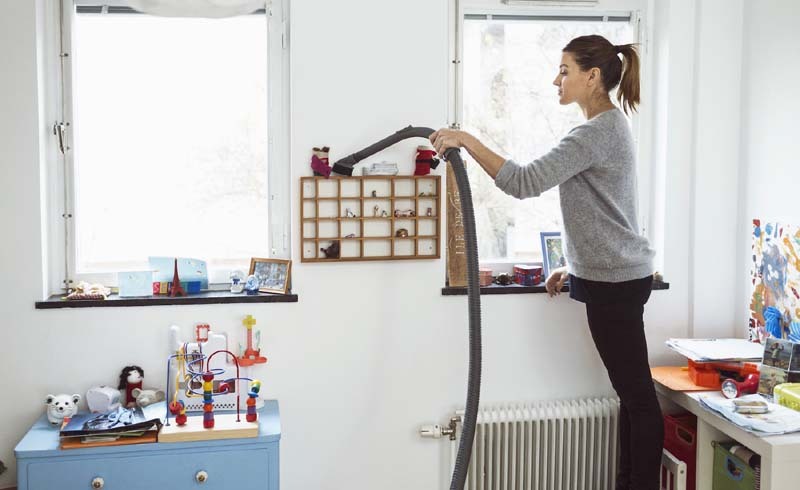 With your priorities in order, you can fake a perfectly clean home in record time. Unless you're hosting someone who has never been to your home before and you plan to give them the grand tour, you probably don't need to clean your master bedroom. Of course, it's a good idea to make the bed and pick up clothes from off the floor (you can collect them in a laundry basket and hide it in the laundry room), but don't even think about organizing your closet or Swiffer-ing under the bed. If you leave the door open, it's possible guests will glance in, but even the nosiest guest isn't going to inspect under the bed. When you have time for a thorough clean, you probably want to get into every nook and cranny, taking the time to dust ceiling vents and lampshades. But now isn't the time. If guests are staying overnight, run a microfiber cloth over things they'll notice, like the bedside table in the guest room, but skip the rest. Again, let's assume that your guests aren't going to nosily peek inside every single drawer and cabinet in your home, inspecting for clutter. Instead, focus on areas they are most likely to see. If you're hosting overnight guests, for example, tidy up your medicine cabinet, or better yet, leave out a tube of toothpaste and an extra roll of toilet paper in a spot that's easy to see so they won't have to resort to snooping. If guests are just coming for dinner, don't bother cleaning your shower. Simply close the shower curtain. If you're hosting overnight guests, it's a good idea to spend a few minutes wiping down the shower tiles and fixtures, but it's not the time for a full-on grout cleaning session. Guests aren't going to know if you have a backlog of laundry to do, so long as it's hidden in the closet or laundry room. The one caveat: throw in a single load of laundry so you'll have clean hand towels, bath towels, and bed sheets for your guests. This is one detail they will notice and appreciate. When you're pressed for time, skip cleaning your window coverings. Instead, spend 15 minutes cleaning something guests are more likely to see, like the couch upholstery. And if you do decide to clean your blinds, invest in this genius blind-cleaning gadget that will speed up the process significantly.